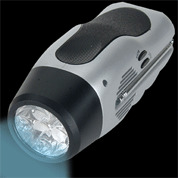 Indoors or outdoors this battery free all weather flashlight with FM scan radio comes in handy during emergencies. No batteries needed to use the flashlight or the radio. Just crank the handle to charge the built-in re-chargeable battery. Powerful flashlight uses 5 super bright LED bulbs. A minute of winding will give you 15 minutes of light or radio play. Dimensions: 6 x 2 � x 2 � in.